I didn’t post yesterday, but it’s ok because really yesterday and today go together. Two years ago, we took a four-and-a-half-year-old Eddie to Chicago for two nights. A two-year-old Charlie stayed with my parents. It was such a fun trip and he mentioned over and over that maybe next time Charlie could come along. 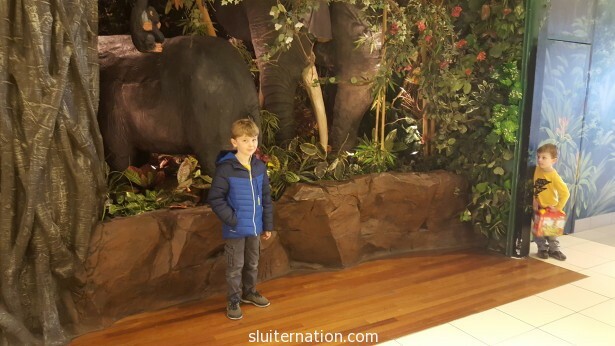 This year since Charlie is now four, we thought we would take both boys overnight to Gurnee (north of Chicago) so we could go to Gurnee Mills and do Rain forest Cafe and the Lego store. Alice stayed with my parents. It was fun, but Cortney and I think perhaps we should have waited one more year. Charlie was a little, um, maybe not ready? Yesterday started off quite challenging. The boys would NOT calm down. They were over-excited and just bickery about everything. Charlie has no concept of how long minutes and hours are, so although I kept telling him that Dad Dad had to work until after lunch, he whined and carried on that he wanted to leave now. 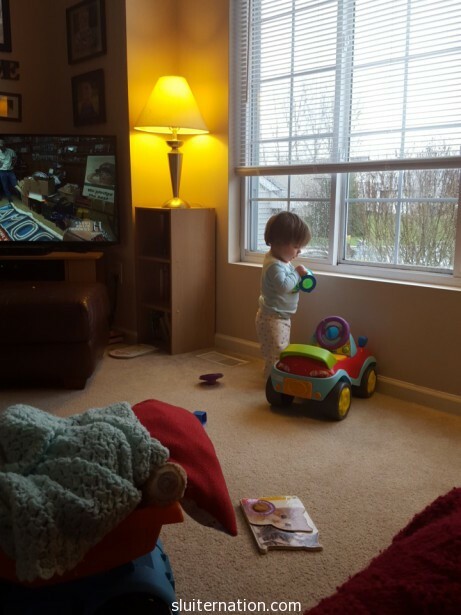 By the time the boys and I went to drop Alice off to my parents’ house, I was ready to call the whole thing off. But I didn’t. When we finally left around 2pm, it didn’t take long for the boys to pass out. Glorious. I will say this about our kids: they road trip well. We don’t have a DVD player in my truck nor did we bring any electronic devices. I packed some activities like coloring books and dinosaurs, but I never had to get any of it out. The boys are content to sleep or just ride. Due to the excitement, there was some fussing for the last 30 minutes or so, but overall I am pretty impressed. Also Charlie never needed to pee the entire three hours there or back. Kid has an iron bladder. 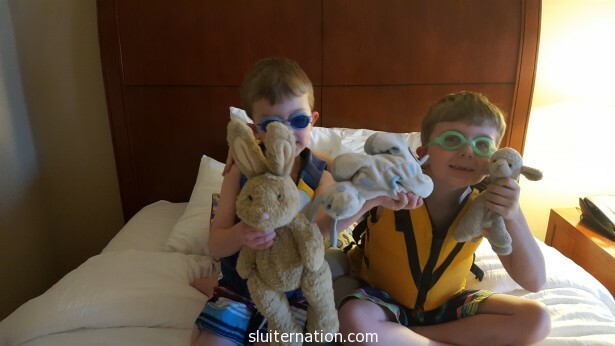 The boys totally waltzed into our hotel ready for the pool: Eddie had on his goggles and Charlie had on his goggles and life jacket. Over his clothes. We needed dinner first though, and since Cortney and I stayed in this hotel last year for our anniversary, we knew their restaurant was super yum. They made chocolate for the boys (they only had white milk, but our server was all “I bet we have hershey’s syrup!”) and everyone who saw him complimented Charlie on his life jacket. We really love the staff there. Every single person on payroll there was amazing to not just Cortney and me, but to the boys as well. And if you know Charlie, you know he most definitely had a few moments that were not compliment-worthy. 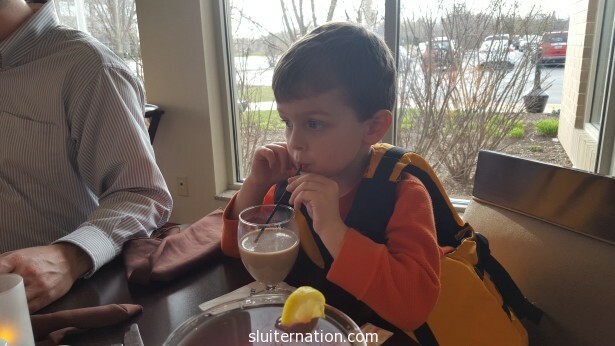 So…if you’re ever in Gurnee and need a hotel, we highly recommend the Hilton Garden Inn. After dinner it was POOL TIME. The way these two acted, you would think the three hour drive was all about swimming in a hotel pool. We did learn from our last trip with Eddie, that it’s a giant part of what is fun for kids when you go anywhere. The other stuff is secondary at this age. Really we could have just gone to the Hampton down the street from our house overnight and if they got to swim in the pool, they would have called it the best vacation ever. 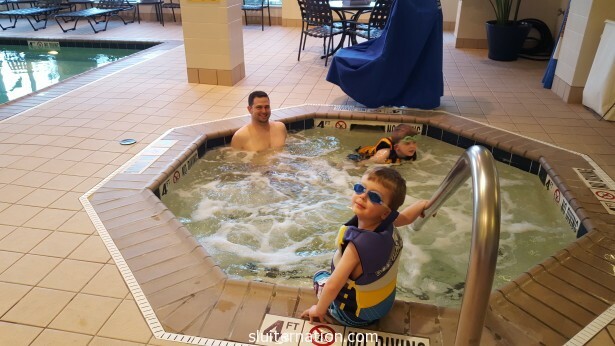 Charlie kept talking about how he hoped they had a “little pool” for him because he is rather cautious when it comes to water and big pools make him nervous. I couldn’t remember if they had a hot tub or not, but everyone was thrilled to see that yes, yes they did. Cortney and I even got in there. It was pretty glorious. Eddie very quickly tired of the hot tub, and upon realizing the “big pool” was four feet at it’s deepest point, he ditched his life jacket. That’s right, my boy is over four-feet tall. Sigh. Plus he’s had enough swimming lessons that we felt cool with that. Because of the time change, it was well past their normal bedtime by the time we got upstairs and in jammies. 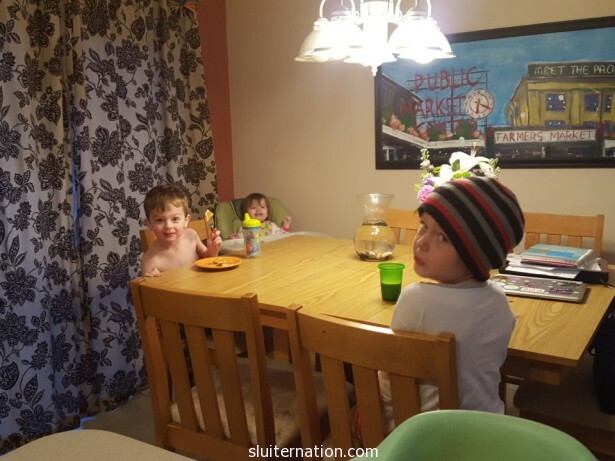 The boys had a little snack and we watched the Johnny Depp Charlie and the Chocolate Factory. When it was time for lights out, Cortney and I learned within five minutes that the boys were definitely NOT going to be able to sleep together. So Cort and Charlie switched. And then Cortney and I found out that Eddie’s warning of, “Dad. 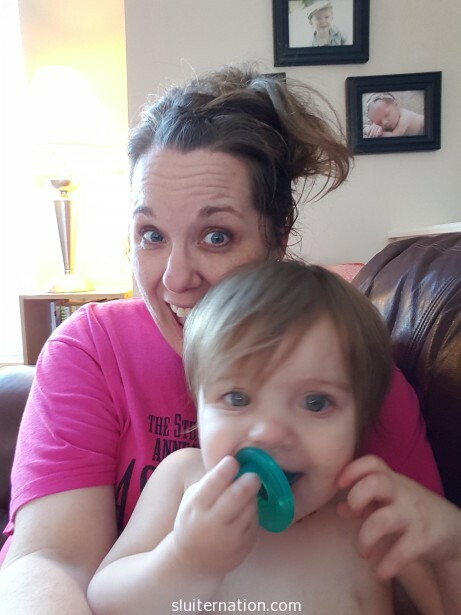 Just so you know, I move around a little in my sleep,” applies to both of them and is very, VERY understating the very real aerobics both boys do in their sleep. So no one slept well. Then everyone woke up cranky. Cortney, being the upstanding guy he is, offered to take the two hooligans downstairs for breakfast so I could snooze a bit longer. The story I got back was not a good one and involved two of the three of them rolling around trying to kill each other in the lobby. So then they went swimming again. That was going, well swimmingly, until Charlie’s fingers got caught in a very heavy bathroom door. Then there was screaming and more tears and I said silent prayers that we were, again, the only ones in the pool area. Cortney took Charlie up to the room and I let Ed swim a bit longer. When we got upstairs, Charlie was all red-eyed, but hunkered in the bed watching cartoons. 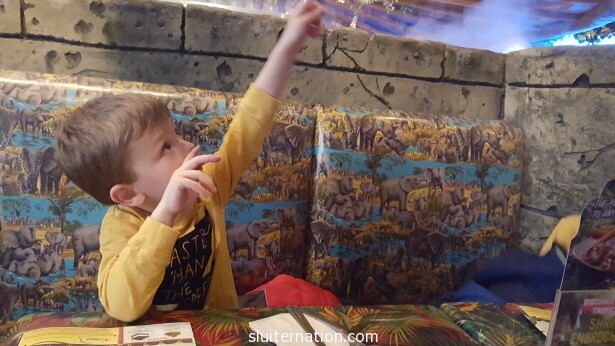 We decided to get everyone ready, check out, and head to the Rain Forest Cafe for lunch, hit the Lego store, and book it on home. I was nervous about Mr. Bird since he was two for two on terrible restaurant behavior, but he was quite taken with the Rain Forest Cafe. Everything was AWESOME! Eddie didn’t like the loud noises…or the elephant butts I made him stand by for a photo opportunity. Whatever, dude. You are not too cool for elephant butts. 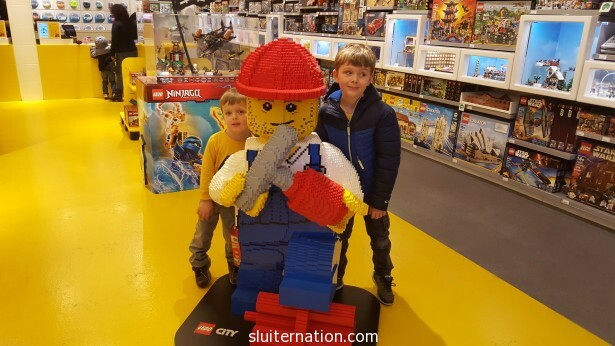 Finally we got to the Lego store. Cortney took Ed and I took Charlie and we set off to find them some treasures ($25 or under) to take home. 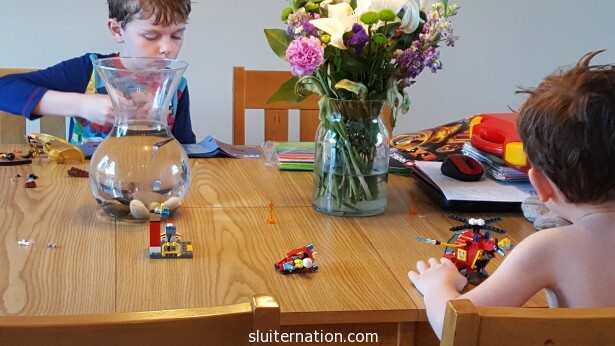 Charlie chose a Lego Junior set with a firefighting helicopter and motorcycle while Eddie chose a small Angry Birds set and a small Ninjago set. Cortney got himself the Lincoln Monument. I didn’t get a treasure, but that is because my mom bought me the Big Bang Theory set for my birthday last week. It was then time for the trip home. 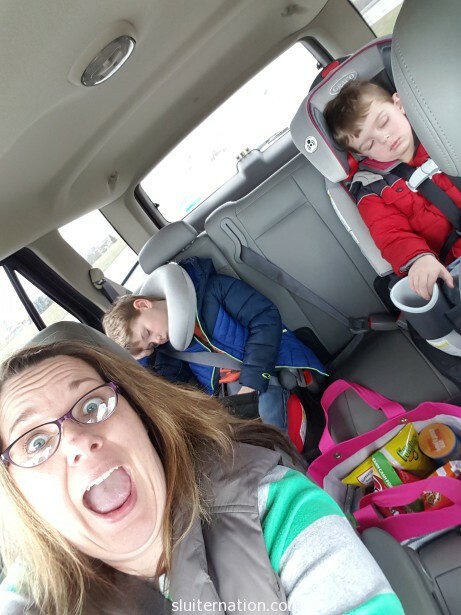 The boys both slept all the way through Chicago, waking just as we were getting to the Skyway. They were super good on the drive home, but started to get antsy to get their sister and get home. I couldn’t blame them, I missed having my little partner around. While it’s hard to say “IT WAS GREAT!” about the trip now, I think it was. We had some challenging moments for sure, but I think it was good for the boys to have us totally focused on them–they each had a parent. Plus both boys said to each other more than once, “You’re my best bud, right? We are trip buds!” And that is awesome. That is how brothers should feel about each other. Even if they also want to pound each other. So while Cortney may not agree with me yet, I am calling this endeavor a success. One more day off and the it’s back to our regularly scheduled life. I did it again! 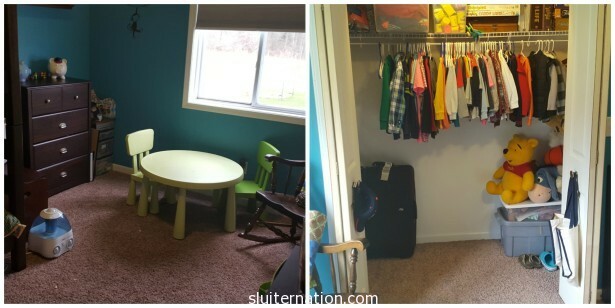 I had a day without children and I cleaned and organized! Ok, so the day didn’t start with a massive sleep in today, though. The kids weren’t due at their respective fun until 9:00ish, so at 7:00am (THANK YOU, CHILDREN!) everyone was up and clamoring for breakfast. In fact, there was so much of the I’M HUNGRY! that you would swear we didn’t feed them dinner the night before…and we totally did. Charlie even ate a ton! It’s a win all around. Oh, and yes, Charlie is shirtless and Eddie is wearing a winter hat. Both for no apparent reason other than it was breakfast time. They were quite, um, full of it this morning, so after some voice raising, everyone got cleaned up, dressed, and was ready to go by 8:45am. We dropped Alice off at daycare, then headed over to my parents’ house where the boys were going to spend the day with grandpa. After getting them inside, Ed informed me I could leave. He did not have to tell me twice. I dropped off all the loot I cleaned out of Alice’s closet on Tuesday to Good Will and then stopped for some Starbucks. Once home, I enjoyed my coffee and a little Today Show. 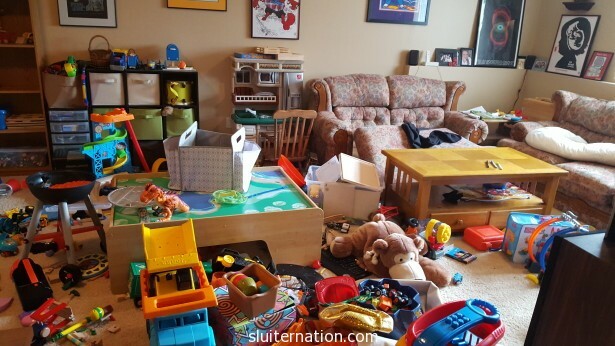 Then I gathered up my trash bags, tunes, and beverage and headed downstairs to the two scariest rooms in the house: The boys’ room and the toy room. Now, to be fair, Charlie extra-trashed the room the day before and I didn’t bother doing anything about it because I knew I would be cleaning and organizing today, so this is a little worse than normal. But the closet, yeah, that is just how it was. So much stuff. Last weekend I went through and took out all the boy clothes that don’t fit Charlie anymore and gave them to our nephews. 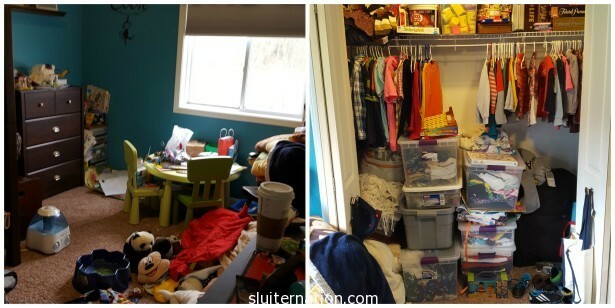 And yes, it still looked like this despite cleaning out two tubs of clothing. QUIT JUDGING ME! Anyway, someone asked me on Facebook today how I tackle something like this. First, I try not to let it get like this. But we are just coming out of the Baby Days, so there was a lot built up that could finally be purged. I have been looking forward to this day for a long time. Anyway, I just start. In the boys’ room I started with the books/toy cubbies. I organized all the books and weeded out all the broken or ‘what the heck is this?’ toys from the three toy cubbies. I then sorted them into Duplos, Bey Blades, and Misc. Then I made the beds. Right there made it feel like I had half the room done. The easy half. So then I just kept going around the room. Next up was the toy box. Then the dresser. Then the craft area (hint: I threw away 2/3 and only put back 1/3). Then the closet. We still store quite a bit in there, but not as much as before thanks to my lack of attachment to things that we haven’t used in who knows how long. I three three bags of garbage away out of this room. Most of it was “art”. I hauled another bag+ out to be donated. Cortney came home shortly after I finished this room, so I took a break for lunch. Then it was time to face the beast: The Toy Room. I have no good excuse for this. The boys’ room I actually tidy up from time to time, but I just close the closet. Out of sight, out of mind. This room? I just don’t go in it. I avoid it. Then it ends up looking like this. Charlie has a bad habit of bringing toys upstairs to play with and then when told to bring them back down, they just get set in the room rather than put where they belong. Also all his birthday presents were “set” in here. And there are things that just don’t get played with or are broken. So again, I just picked a place and started. 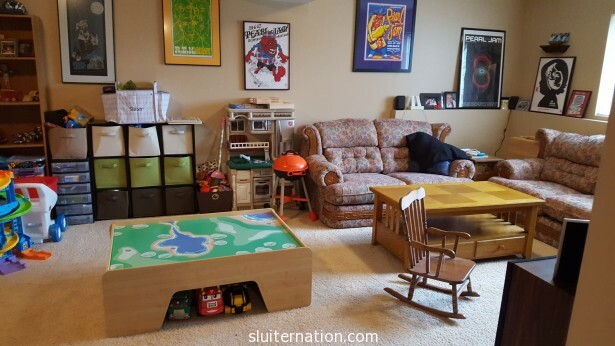 In here, I began with the couches and the coffee table and worked toward the mega-mess-center. Then I worked my way around the train table. I had all the totes set out for sorting plus a trash bag for dump and one for donate. I filled another trash bag and two more donation bags. I found homes for all Charlie’s new toys either in their closet (all that space!) or in the freed up space from donating things. The entire house now needs a really good vacuuming, but at least the carpet is visible to do so. The boys were hilarious when they saw the downstairs. Both ran around yelling that I am the best mom ever. Huh. I just had to clean up their horrendous mess to get that title? Who knew? 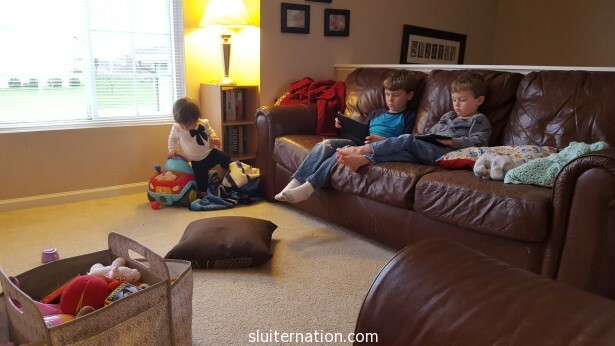 They all must have had a big day because they all zoned out after dinner until bedtime. yeah, that probably won’t happen two days in a row. But I can dream, right?